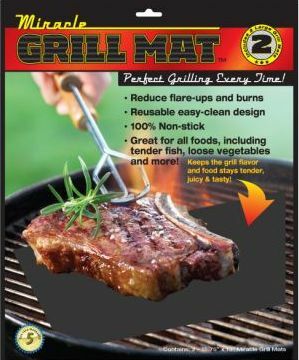 Grill indoors or out with fewer flare-ups, no dripping or sticking while the grill stays clean with the Barbecue Grill Mat | The Miracle Skewer is the convenient, flexible, reusable grilling essential! | The Miracle Baking Mat allows you to cook and bake with no sticking and no need for fats or sprays. You will grill like a master without having the usual drudgery of cleaning the grill afterwards. Use it indoors or outdoors, on any grill – charcoal, gas, or electric. The PTFE (PFOA FREE) coated fabric brings truly nonstick cooking to your grill. Sticky BBQ sauce, vegetables, grease will all wipe off. Reduce flare- ups and keep your cooking even, while still getting grill marks on your food. Now you can cook sausage, bacon, and even eggs for breakfast right on the grill mat. Even pancakes! The flexible stainless steel cable works like a needle and thread; simply slide food onto the skewer, place on grill and drape the ends over the edge. Ends stay cool to the touch, making for easy turning and more evenly grilled results. Prior to grilling, marinating your food is a snap! Simply skewer meats and vegetables then place the flexible skewer within a marinating bag. The Miracle Skewer is made with 100% stainless steel; it is dishwasher safe, extremely durable and will not rust. The Miracle Skewer is ideal for kabobs, beef and chicken, shrimp and seafood, vegetables of all kinds, even grilling of foods, easy marinating right on the skewer, cool touch turning of food and much more! The Miracle Baking Mat is a versatile, reusable kitchen essential. 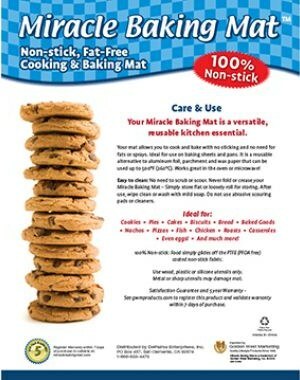 The Miracle Baking Mat allows you to cook and bake with no sticking and no need for fats or sprays. Ideal for use on baking sheets and pans. It is a reusable alternative to aluminum foil, parchment and wax paper that can be used up to 500°F(260°C). Works great in the oven or microwave! Ideal for: Cookie * Pies * Biscuits * Bread * Baked Goods * Nachos * Pizzas * Fish * Chicken * Roasts * Casseroles * Even eggs! * And much more! 100% Non-stick: Food simply glides off the PTEE (PFOA free) coated non-stick fabric. Warranty: Satisfaction Guarantee and 5 year Warranty.